In our Lab we can test precious metal catalysts, e.g. 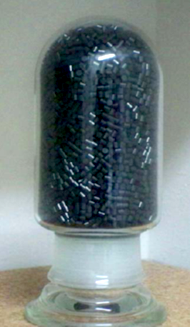 platinum or palladium types, for effectiveness in Deoxo and CATOX reactions, and base metal materials, e.g. copper based or nickel based types, as Oxygen Getters - for O2 removal by chemisorption. This capability serves primarily in the benchmarking of catalysts we may offer, and in assisting customers in deactivation studies on aged catalyst samples from their plants. Additionally, we handle analyses for catalyst contamination, assaying for foreign substances including carbon, sulfur, silicon, and halides which may be fouling or poisoning the catalyst.